Almost at eye level and opposite the clock disc there is the area of the calendar disc. 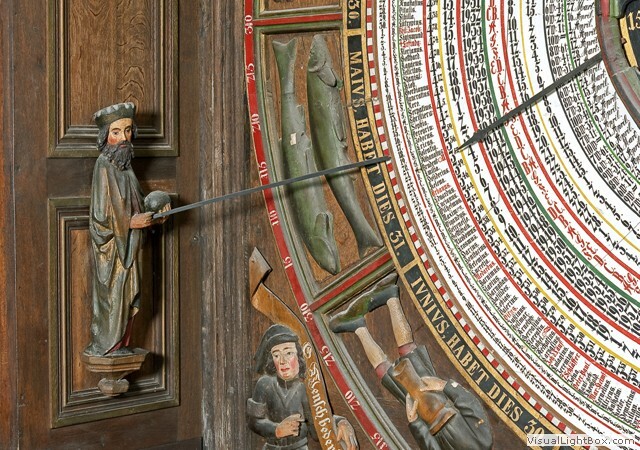 On the left margin there is the calendar man who points at the current date with his stick. 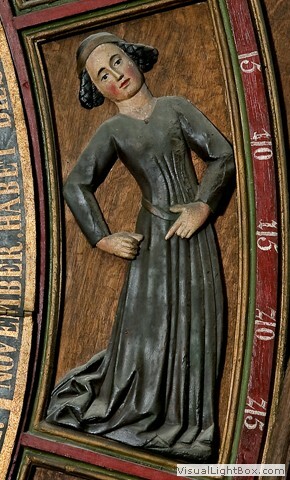 In the four corners around the calendar disc there are four antique carved figures. 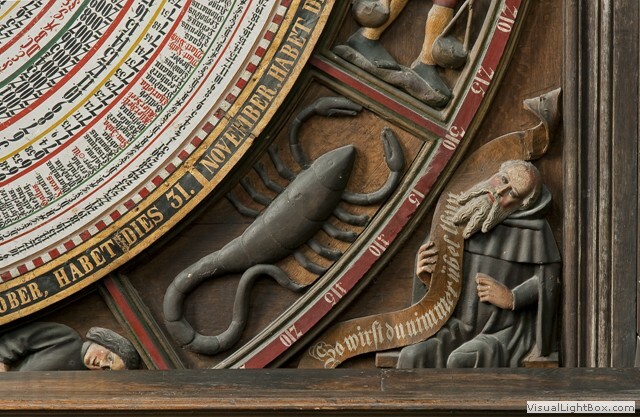 Their artistic shapes as well as the form of the figures of the zodiac around the calendar disc prove that this part dates from 1472. The clock disc was built this year as well. 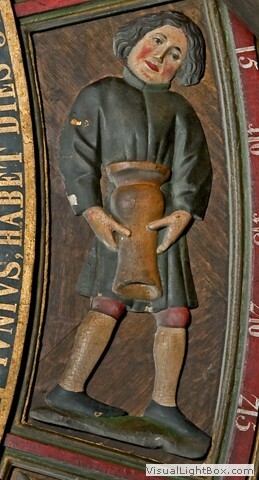 The portraits of the scholars in the spandrels you can find very often at older monumental clocks in churches of the Hanseatic Times (Doberan, Lübeck, Lund, Stendal, Stralsund). There they can be mostly found on the margins of the clock disc. 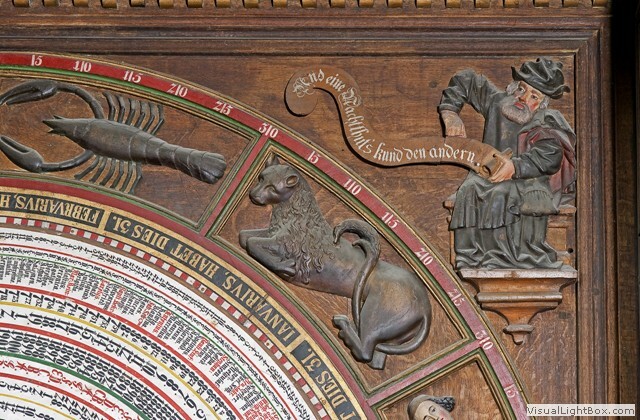 The signs of the zodiac around the calendar disc and the clock disc were maybe created in the same workshop at the same time. But here the Aries is located left from the calendar disc. The other signs of the zodiac follow the clockwise direction. 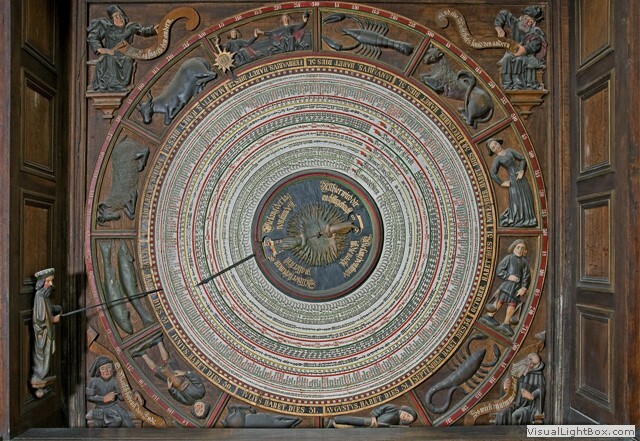 This means that the calendar disc – were you can find a hand that indicates the position of the sun on at the place of 25 February - operates clockwise as well. - the details of the seven inside rings belong line by line to one of the years from 1885 bis 2017. 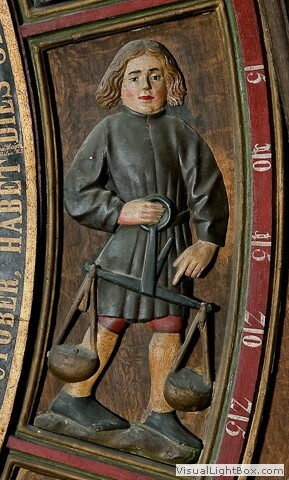 Let us have a look on the group of the external rings: Outside on a steel plate which covers the gap between the fastened ring of the zodiac and the moving calendar disc you can read for each month: "JANUARIUS, HABET DIES 31", "FEBRUARIUS, HABET DIES 28" etc. to "DECEMBER, HABET DIES 31". Then the 2 ring with 366 red and white segments follows. In the 3_ring there are the dates of the days of the month. There is no date of 29 February. 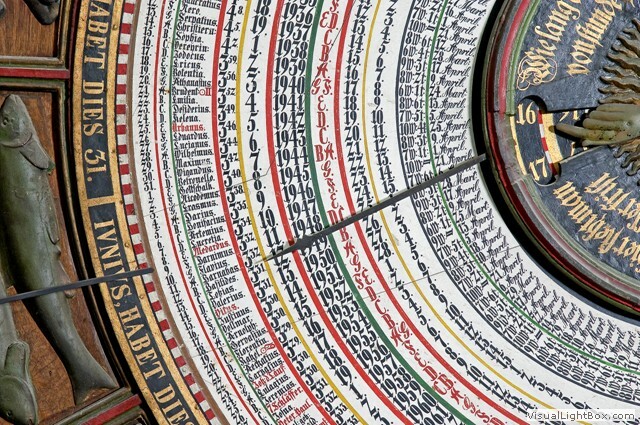 The Hanseatic people of the 15 century were very economical calculators: It was cheaper and more reliable to notch the calendar work every four years on 28 February than to have a new expensive, complicated and damagable mechanism constructed to consider the 366 day in a leap year. The stick of the calendar man points at the current data in the ring. The seven letters correspond to the days of the week: The letters of the day correspond to the letters of the week. The 5_ring contains the calendar of the Saints and festive days. Important festive days are marked in red colour. The 6_ring indicates the local time of the sun rise for two days. New Year’s Eve is not taken into consideration. This day has its own time of sunrise – 8:26 a.m. Therefore there are 183 times allocated to 365 days. The current time of sun rise is indicated by a hand which is fastened on the centre of the disc. 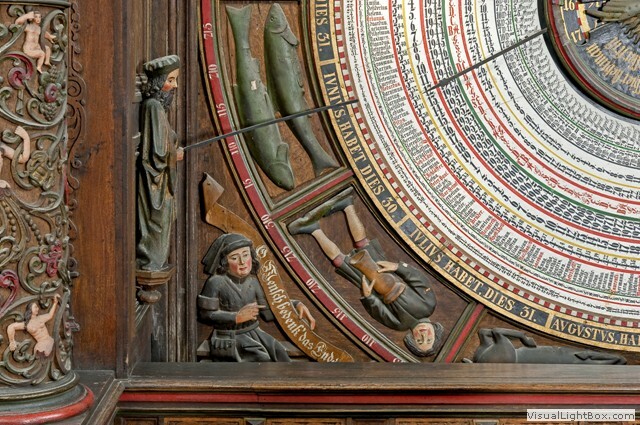 The display of the time of sunrise is very special for the Astronomical Clock in Rostock and the former one in Lübeck. It refers to historical correlations. 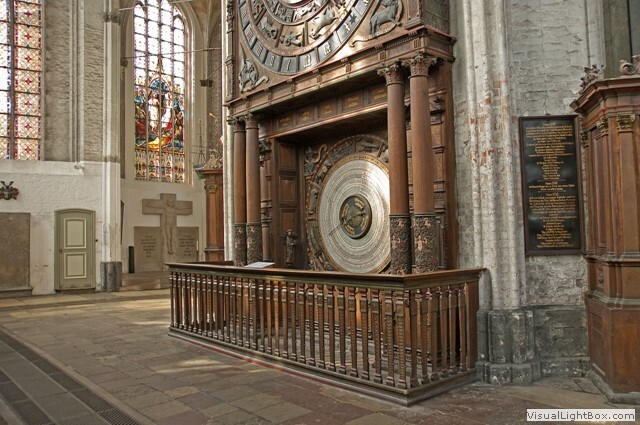 In the MARIENKIRCHE in Lübeck the time of sunrise has been displayed since 1562, in the ST.-MARIEN-KIRCHE in Rostock it has been displayed since 1643. The times of sunrise in Rostock range from 3.29 am (20/23 June) to 8.31 am (19/20 December). It refers to the local time. When these data were introduced in 1885 there was no Middle European Time (MET) yet. If you take the sunsets into consideration there is daylight between 17 and 7 hours with the night lasting 7 to 17 hours. 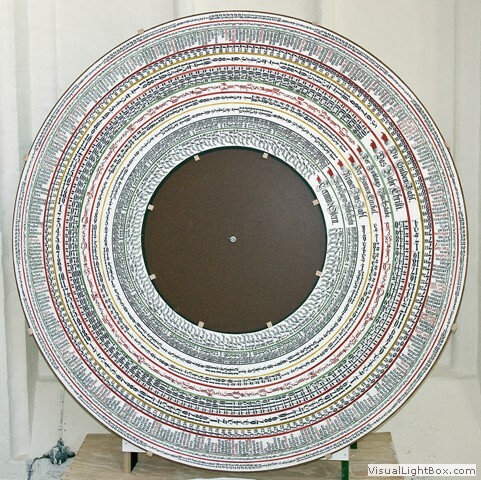 This fact is shown in the centre of the calendar disc that is covered by another disc with two openings. 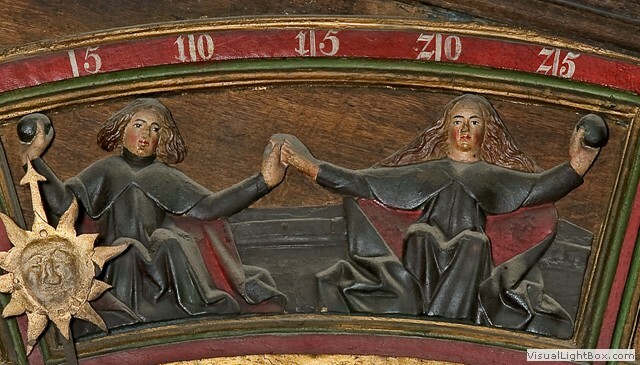 The index fingers of two hands point at the duration of the daylight (left) as well as at the duration of the night (right). Next to the windows you can read: "Allhier sieht man zu aller frist / wie lang' der Tag von stunde ist" und "Allhier wird dir auch fürgebracht / wie lang' von stunde ist die nacht. "(referring to the hours of daylight and the duration of the night).One could suppose that the centre of the disc used to carry a figure of (Mary?). The group of the interior rings: The numbers and letters are allocated to the years 1885 – 2017 which are line by line in the 8_ring. For example: The year 2017 will have the Golden Number 4 and the Sunday letter A. It will be the 10 year in the circle of the sun and it will be the 10 year of the Roman interest number. Between Christmas 2016 and Shrove Tuesday 2017 there will be 9 weeks and 2 days. Easter will be on 16 April. What does the details in the rings mean? The Golden Number in ring_7 is the periodic numerical order from 1 to 19. The knowledge from ancient times that the phases of the moon have the same date in the calendar every 19 years formed the basis for it ("Metonscher Zyklus"). 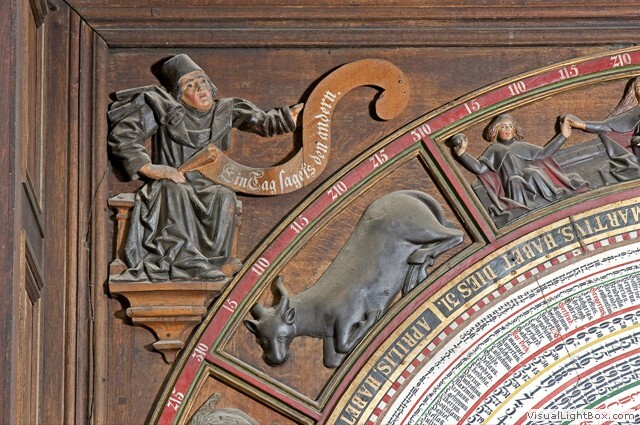 The Golden Numbers were never missing because the phases of the moon were a parameter to determine the date of Easter. In ring_9 there are the Sunday letters. There is a relation to the day letter (ring 4): The Sunday letters indicate the days of a year that are Sundays. In 2017 (Sunday letter A) all days with the letter A will be Sundays: 1 January, 8 January, 15 January ... 31 December. If you know the Sundays it is not difficult to find out the days of the week for every other date within the duration of valitity of ring of the year on the calendar disc. You read the Sunday letter according to the year. Next to the searched date you look for the day with the same day letter. By going back or forward you get the searched week day for the certain date. For example: 24 December 2005 - the year 2005 had the Sunday letter B. The letter that is next to the 24 December is B which belongs to the 25 December. That means the 24 December 2005 was a Saturday. Leap years have two Sunday letters. The exterior one indicates the months January and February and the interior one shows the period between March and December. The Sunday letter was also necessary to define the date of Easter. This way it was possible to define the first Sunday after the first full moon in spring. The circle of the sun is shown in ring_10. This way the series of digits from 1–28 is mentioned which indigates the repetition of the cycle of the calendar. The calendar of a leap year starts again after 28 years: The calendar of 2004 is similar the one of 1976 and can be used in 2032 again. Preciseley said the cycle of the calendar from 1976 to 2003 is similar to the one of 2004 to 2031 as well as of 2032 to 2059. The Roman interest number is indicated in ring_11. It refers to a 15-years-tax-cycle that was introduced by the Roman Emperor Constantine the Great in 313 AD. The years within a cycle were numbered from 1 to 15. In the years that had the same interest number people were obliged to pay the same taxes and interests. Until around 1500 the certificates of the Roman interest number were used for dating. The so-called interval is shown in the 12_ring which corresponds to the period from Christmas to Shrove Tuesday. Christmas is always on 24 December and Christmas Day is on 25 December. The date of Shrove Tuesday is changeable. It is dependent on the date of Easter which can be between 22 March and 25 April. Shrove_Tuesday_is_always_48_days before_Easter (including Easter Sunday and Shrove Tuesday). Therefore Shrove Tuesday can be on 3 February at the earliest (if it is no leap year) and on 9 March at the latest. The shortest interval comprises 5 weeks and 5 days (25 December – 3 February). The longest interval lasts 10 weeks and 5 days (25 December – 9 March) in a leap year. On the current disc the earliest date of Shrove Tuesday is only displayed for 1913. The latest date for Shrove Tuesday possible is not mentioned. On the next inscription of the disc these two dates will not be included either. Last but not least the Easter dates from 1885 to 2017 are displayed on ring_13. They are the highlight of the mediaeval calendar dates. Easter as the most important religious celebration underlining the suffering, the crucifixion and the resurrection defines the most important of the three variable calendar cycles of the Christian year. The Easter cycle starts at Shrove Tuesday with the Lent season beforehand and finishes with Trinity Sunday (8 weeks after Easter) or the Feast of Curpus Christi Fronleichnam (catholic: 60 days after Easter). The Easter date defines the beginning and end of this cycle. On the Synod of Nicäa in 325 the first Sunday after the first full moon in spring was appointed. The beginning of spring was fixed on 21 March. Easter is on 22 March if there is full moon on 21 March which must be a Saturday. If there is full moon on 21 March and on 19 April again and if this last date is a Monday then Easter takes place at the latest possible date. 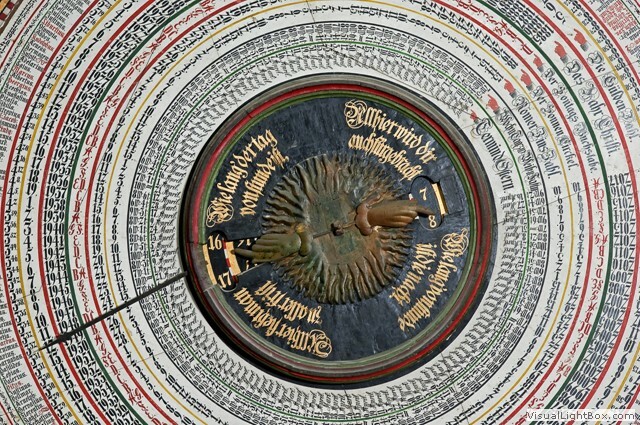 The current calendar disc is the fourth inscription of the calendar disc in Rostock. 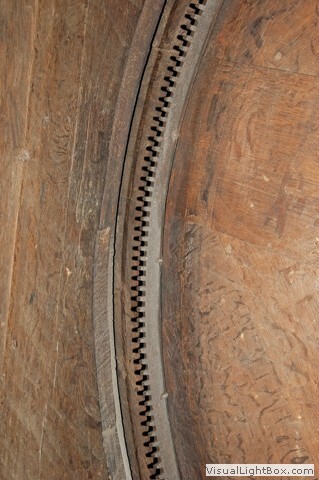 The first one was fastened in 1470/72. 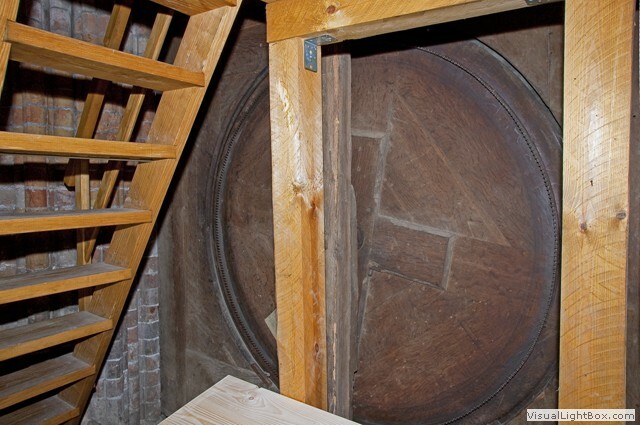 The second one dates from 1643 and lasted until 1744. The third one was calculated by the pastor and scholar Johann Hermann Becker (*1700 in Rostock, +1759 in Lübeck) and comprised the period from 1745 to 1877. The current one dates from 1885 and finishes in 2017. 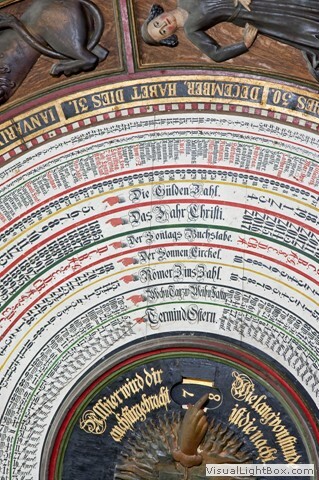 The next calendar disc for the period from 2017 to 2150 – lasting 133 years – was given to the city council and the church by the author of this text in 1994. The new disc was inscribed in 2009 and is ready to be installed at the end of 2017. 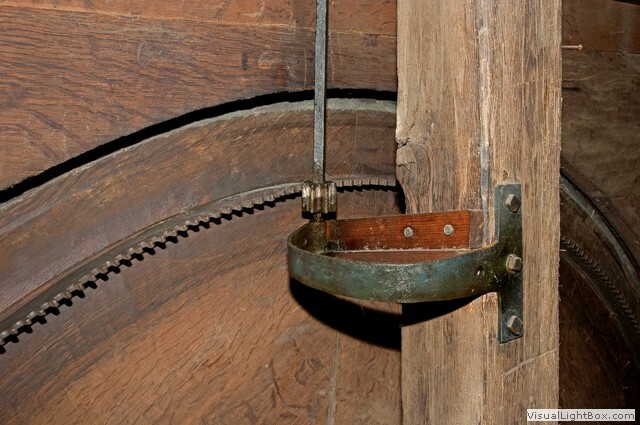 The data on the calendar disc have remained unchanged since 1643. This will be the case on the new one as well.